This full bodied, caffeine free alternative to coffee has been a trusted favorite for more than 30 years. 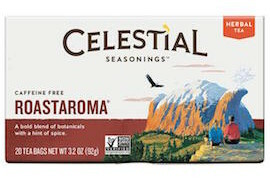 With the robust flavors of roasted chicory and barley, a hint of chocolate from roasted carob and just a touch of cinnamon and allspice, Roastaroma is hearty enough to give you a lift in the morning and delicious enough to enjoy all day long. Ingredients: Roasted barley, roasted barley malt, roasted chicory root, roasted carob, cinnamon, allspice, and Chinese star anise. Contains gluten.